Tell us your story… Pierce and I met in high school French class in Michigan. We stayed friends for years before starting a serious relationship later when we ended up at neighboring colleges in Missouri. Seven years later, we decided to tie the knot! Where did you two tie the knot? Our wedding was at the gorgeous Felt Mansion in Saugatuck, MI. We knew we wanted to centralize our wedding in Michigan, where our story began. 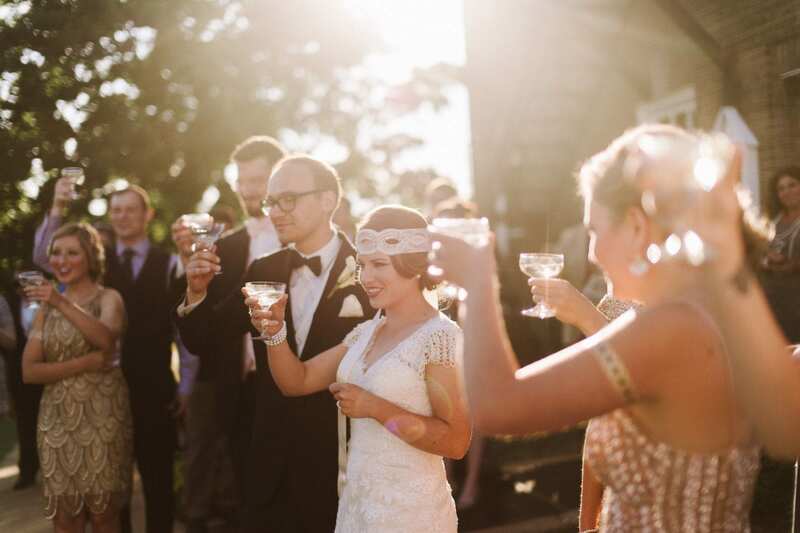 We both love historical places, and this venue also fit our 1920s/Great Gatsby Wedding theme. It was the perfect location to relive the decadence of the era that we wanted to reflect in celebrating our wedding, with our own version of a Gatsby house party! Spill the details about your wedding! The wedding really did feel like a mansion house party in the roaring 20s! The mansion itself has been maintained perfectly with period furniture and required little additional decor. I chose glittery gold/black as the main theme colors, with blush and champagne tones complimenting throughout our decor. My girls wore sequined short dresses with a modern flapper feel, while the guys all wore black tuxes with blush vests/bow ties. Calla lilies completed my art deco look in our bouquets, the boutonierres, and the DIY centerpieces that I made for inside the mansion. My custom dress had so many gorgeous pearls on the back piece and sleeves that really completed the decadent feel that I was going for in the whole Gatsby Wedding theme. *I knew Alyson in college many years ago, and always admired her style and eye for design. I followed her growth and brand development on Facebook, and when I knew I was ready to shop for my wedding accesories, I reached out to her. I have always been drawn to unique style pieces, and I had a specific Gatsby bridal look that I was going for. Alyson created the most gorgeous 1920s headpiece and art deco veil for my ceremony and reception wear. I was absolutely thrilled with the results, and got SO many compliments on my accessories on my wedding day! What was your favorite moment? I can’t pick a favorite memory! The whole entire day was my favorite. People came from all over the country to witness and celebrate our marriage, and everything ended up going so exactly perfectly that the day was absolutely a dream come true. From walking down the aisle to a perfect white chapel to marry my best friend, to guests taking selfies with a polaroid for our guestbook, to our dog Gatsby wandering out on the dance floor during our first dance, to the sun setting over the back porch of a gorgeous mansion filled with food, family and friends – there are too many great memories to pick just one!